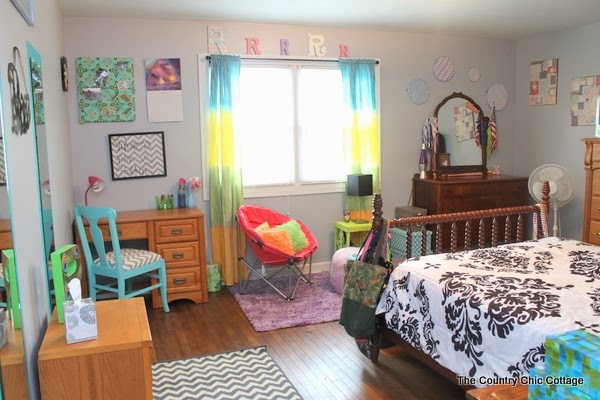 The time has come y’all for my teen room reveal. 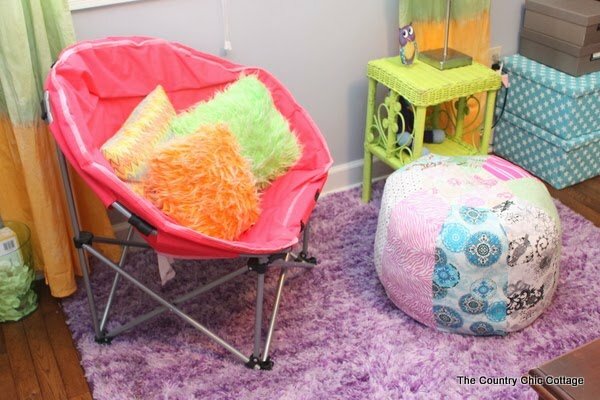 Hang on to your hats as I show you the fun and colorful teen room I put together on a budget. Plus I will share links to tons of DIY ideas that you can make for your own home. Lets get this party started! 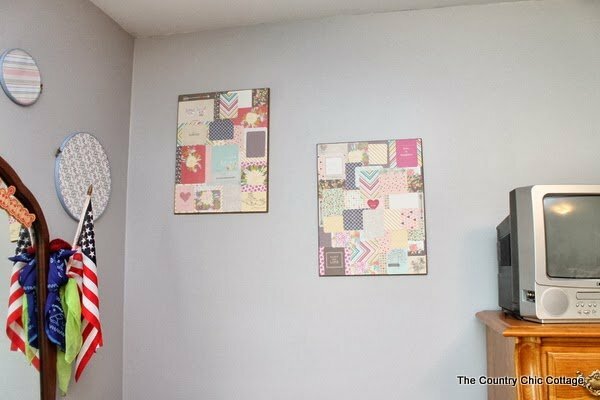 I am going to take you on a walking tour of the room sharing links to the DIY projects along the way. I will also link to some affiliate links which means if you choose to purchase a portion of that purchase will go to support this site. The room is odd shaped so there is actually a little hallway that is part of the room and it is the first thing you see through the door. We painted and decorated it as part of the room itself. The walls are all painted gray except for one (hang on for those details). Out in the little hallway is the door to the closet where we hung a scarf hanger (with an over the door organizer). 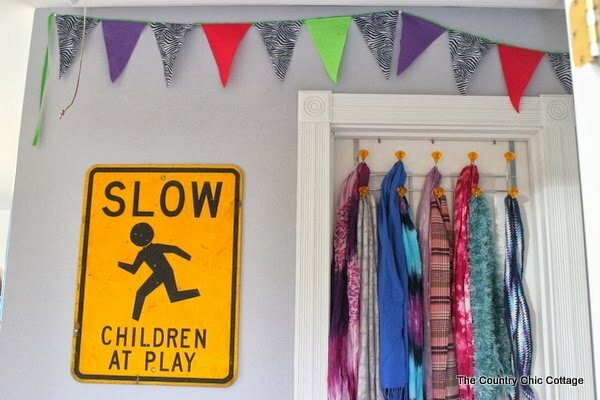 The felt bunting I made last year for her zebra themed birthday party. We reuse party decorations as decor regularly around here. When you turn into the room, you see the wall with the window next. We added tons of color to those gray walls with decor and fun accents. Starting in the study area, we already had the desk and chair but they did not match. So I painted and upholstered the chair so now they don’t match on purpose. I also recovered that memo board a while back on my own. We loved the seat fabric so much that we also added it to a dry erase board. Just pick a frame with plastic instead of glass and add fabric to the inside. So simple yet so cute. We had that pink desk lamp already. Next up is what I like to call the “hangout” area. Complete with a chair and a DIY pouf ottoman. Plus I took my own advise and added some wicker indoors. 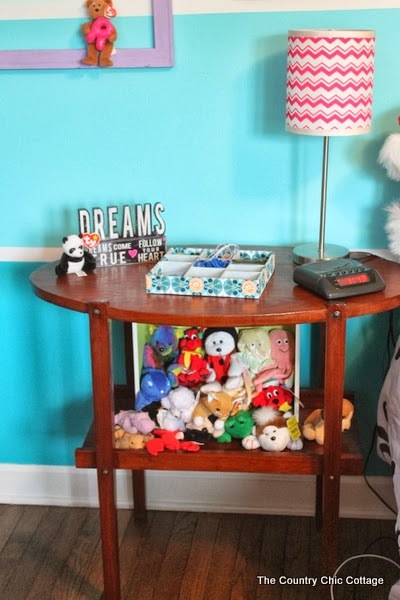 That little table was purchased for the room for $15 at a local second hand store. The purple shag rug was a Target find a few years back. Pick up your own shag pillows here. The window contains a collection of initials above it that we have gathered through the years plus my DIY tie dye curtains. The chair houses pillows that were all Goodwill finds. Most of the furniture in the room are antiques that have been given to us by relatives. The only exceptions are the desk, wicker table, chest of drawers and bookshelf. This gorgeous mirrored dresser is no exception. It is perfect for a teen room. 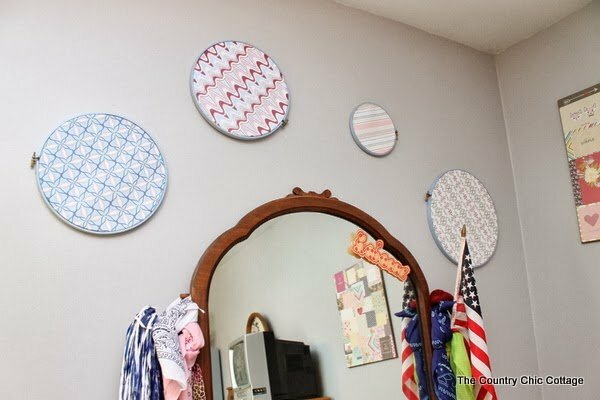 The DIY embroidery hoop art made its way above the mirror and looks absolutely perfect. Next to that is the Project Life collage art that my teen made herself. It is full of inspirational quotes and fun pictures. 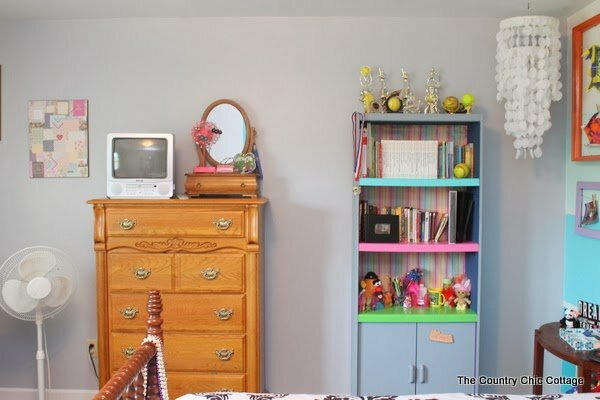 The next wall has her chest of drawers and color block painted bookshelf. 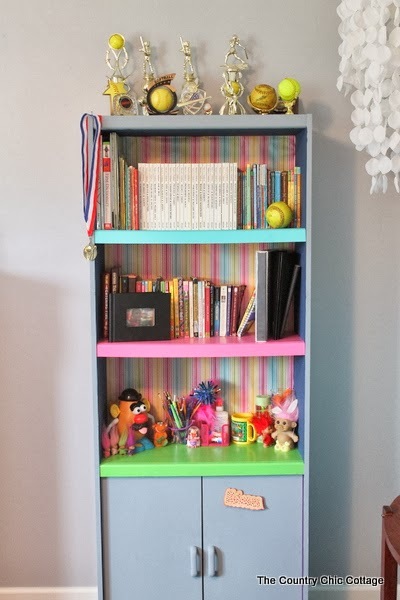 The bookshelf was completed with her trophies, books, and other mementos. Next to it hangs the rose petal chandy that I made years ago. She still loves it and it still looks great. Now for the main focal wall behind her bed. 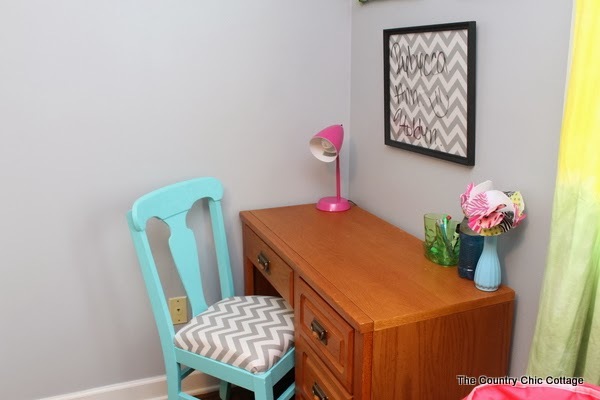 Learn how to get that paint treatment with my DIY gradient wall post. We went with a black and white comforter set to ground all of the colors some. The bedding is actually from Walmart. 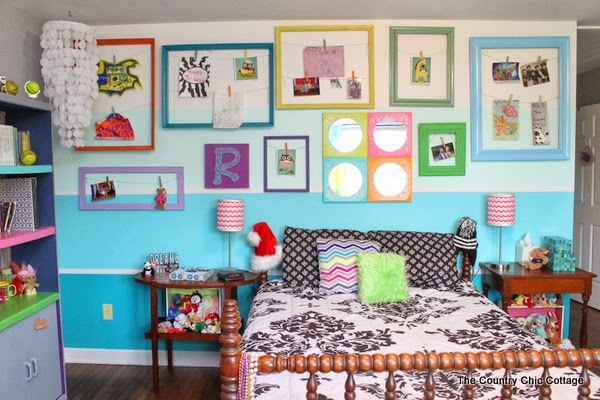 In the center above her bed is the DIY color block mirror. 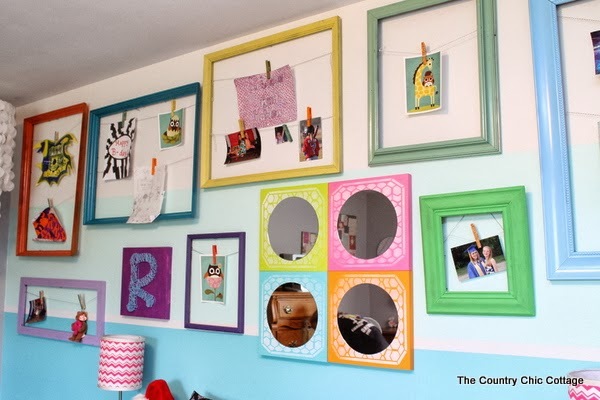 Surrounding the mirror, we added even more colorful frames to our DIY revolving art wall. 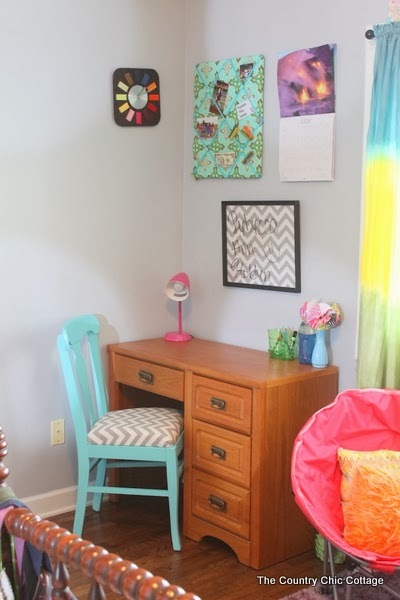 This is a perfect solution for a teen room as they can change up the art and posters on a whim without leaving marks and tape on your walls. Some thrifted frames and paint are all that is required. 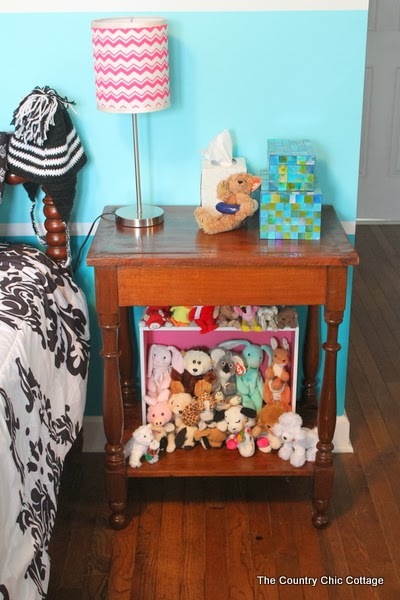 The nightstands on both sides are antiques and house her collection of beanie babies. Those pink chevron lamps are actually from the Fred’s Dollar Store. Finally we are back to the wall that leads to the door of the room. The chevron rug was ordered from Rugs . com. I made the name art above the mirrors a few years back. The mirrors are plain build grade frameless mirrors. I painted frames around them in one of the gradient wall colors. 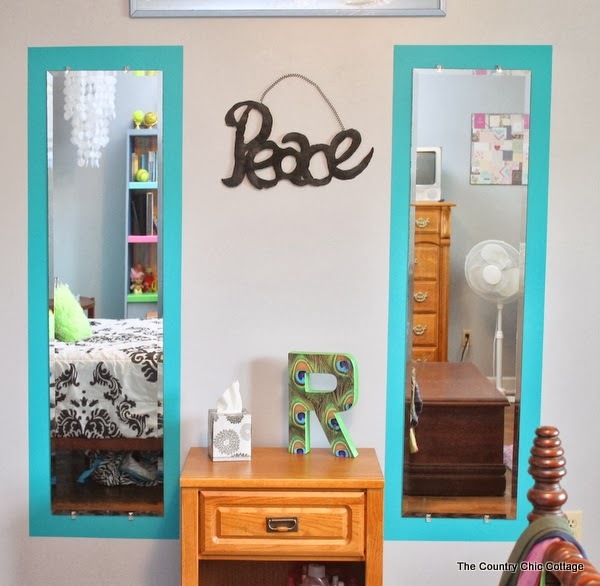 The PEACE art is from Hobby Lobby and we spray painted it black. You can check out how to make that still life monogram knock off as well. That is all for the tour of our new teen room. If you have any questions about the source of an item you see, please leave it in the comments below. I am in love with how our little room makeover came out. 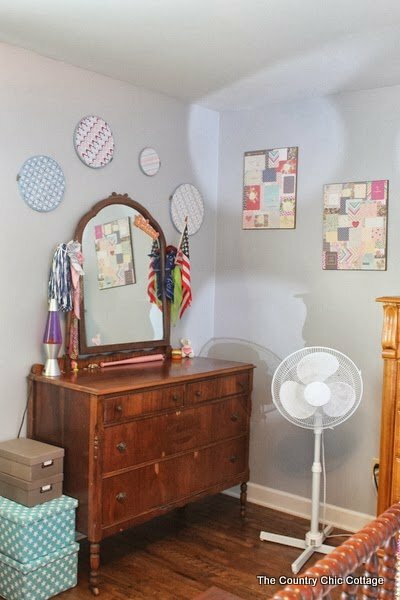 With a combination of DIY and using items we already had on hand, we spent less than $300 on this makeover. I call that budget decorating at its finest! 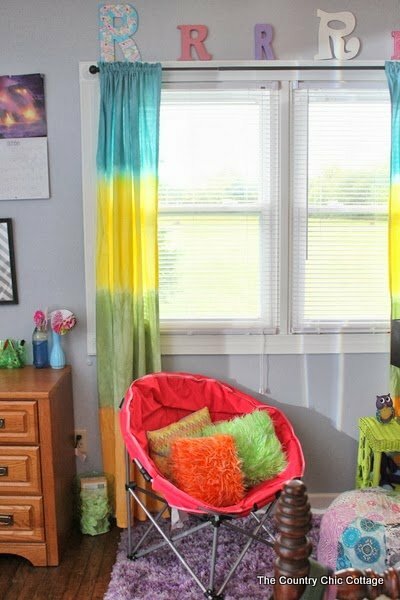 I hope you enjoyed this teen room reveal as much as my teen is enjoying her new fun and colorful room on a budget. Looks great Angie, simply amazing. I love all the color! How did you hang the two mirrors on the wall? 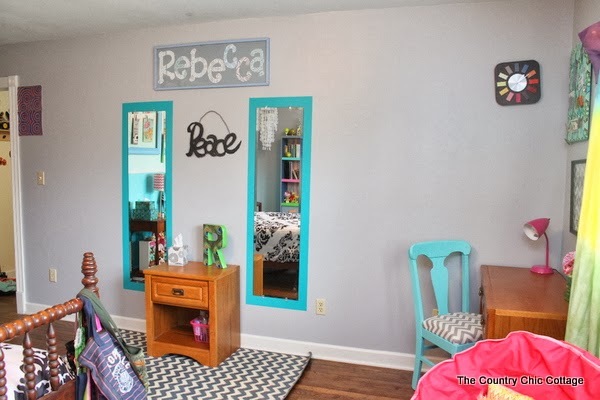 Is the turquoise around the mirrors painted on the wall? What fun! Bright, cheerful, and personal! Simply amazing! I just loved your room! I’m totally in love with that chair in the “hangout” area! I’ve been searching for a chair like that to put in my bedroom for a long time. Well, I know that your relatives gave it to you but do you have any idea of where can I get one of these? I actually live in Brazil so maybe there’s a store in USA or anywhere you live that here in Brazil we don’t have, but any help would be great. Ok only a few things I would change. The quilting hoops above the dresser I would have done string art or dream catcher on it so she could clip flowers and hang earings on display there. its out there on eclectic style though. I would have also covered the plug covers to match the wall not to draw the eye from the rest.